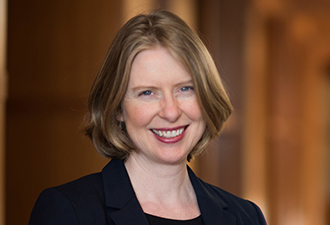 Prior to her appointment at Duke Law, Dean Abrams served on the law faculty of the University of Virginia for thirteen years, and, more recently, as vice provost for faculty affairs. In 2011, she was named the Albert Clark Tate, Jr., Research Professor of Law, and in 2012, she received the McFarland Award for excellence in legal scholarship. As vice provost for faculty affairs, she was responsible university-wide for faculty recruitment and retention, faculty policies, the promotion and tenure process, and professional and leadership development programs for faculty. Dean Abrams is a graduate of Swarthmore College, where she earned a B.A. in English literature with highest honors. She graduated with distinction from Stanford Law School, where she was president of the Moot Court Board and the co-chair of Women of Stanford Law. After law school, she clerked for Judge Stanwood R. Duval Jr. of the U.S. District Court for the Eastern District of Louisiana and practiced as a commercial litigator for several years at the New York City law firm of Patterson, Belknap, Webb & Tyler LLP. She also served as acting assistant professor of lawyering at New York University School of Law, where she taught lawyering skills, including legal research, writing, oral advocacy, mediation, negotiation, and client counseling. She is a member of the New York State Bar and the United States Supreme Court Bar.